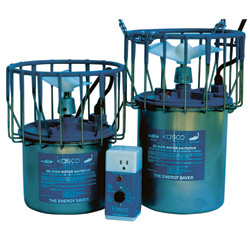 Many people use dock de-icers to protect permanent docks and boathouses from ice damage. However, if these devices are not properly managed or installed, they can create large openings with thin ice that are unsafe for recreation during the winter months. These large areas of open water can also lead to greater ice damage to a dock. By LakeSunapee.org. Bubbler: Works by releasing small air bubbles from a submerged perforated hose powered by an air compressor typically located on a dock or inside a boathouse. Bubbler de-icers don’t stir up lake bottom sediment and are less likely to cause dangerously thin ice conditions. Agitator: Works by circulating the lake water toward the surface. The entire device is submerged in the water and contains a fair amount of lubricating oil that can leak directly into the water from failed seals. This device needs to be used with a timer and/or thermostat to limit the amount of open water. Both of these de-icers only need a few hours each day to do their jobs! In addition, a device that runs for only 2-4 hours a day will significantly reduce operating costs. When the time comes to replace your dock, consider installing one that can be removed from the water (such as the cantilever type). This would eliminate the need for a de-icer device at all! Click here for more information on Lake Friendly Dock Choices. To download a copy of LSPA’s Dock De-Icer Pamphlet, click here.